Kat Goldman is one of Canada's most well loved songwriters. Her songs have been covered by Grammy - Nominated band, The Duhks, by prolific American Singer - Songwriter Dar Williams, and by Australian duo Kate And Ruth, among many others worldwide. 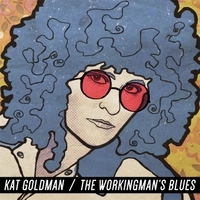 Kat's fourth album, The Working Man's Blues, tells a story of a young, tough-luck man from South of Boston, who struggles to overcome his hard scrabble past. Folk-rock ballads like " Take It Down The Line " & " The One To Dream ". will break your heart, while pop anthem " Don't Know Where I'm Bound " captures the plight of the workingman in America today.